Every farmers' journey through life will be as uniquely theirs as their farm will be. 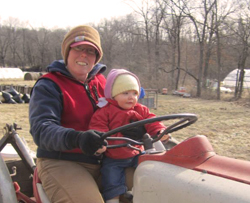 Today's podcast episode shares a great story of how a vegetable farm was started in Missouri not just by one woman, but by a community of people working to support that one woman. I found out very early on that it is not the individual that succeeds, but the group. I could not be where I am today, and I know I couldn't go where I am headed without the support of those people around me. Sometimes that support means they will tell you not to do something, like the recent NY Times article stating "Don't let your children grow up to be farmers." I think that article raises some good points, but is mis-titled. We should not let our children grow up to be farmers that farm like we do today. In this instance I'm not talking about organic or conventional, small or large scale. I am talking about farming within a system built against the farmer where we are faced with often insurmountable tasks on top of the challenge of farming. At its' very base level farming provides people with the basic elements that people need for survival. Food. Even as a tech-friendly guy it baffles me that more time and money is spent on iPhones than learning and investing in what we eat. How is something so necessary so often swept aside. It is our job as small farmers, who are intimately connected to our communities, to help educate and empower others so that they will help fight the food fight for our team. Happy Hollow Farm is nestled among the rolling hills along the Missouri River. The primary growing fields border the Little Splice Creek bottom and thus benefit from beautiful silt loam soils that are rich in organic matter. The farming techniques used on this farm are a combination of highly managed cover cropping, crop rotations, the application of compost, mulch and small quantities of minerals and nutrients. Liz's goal is to give back more to the soil than she take. How are you contributing toward making our world a better place through food? What do you think our biggest obstacle is? How do you think we'll overcome it?